This white paper examines the challenges of content protection and user acceptance of content protection technology. 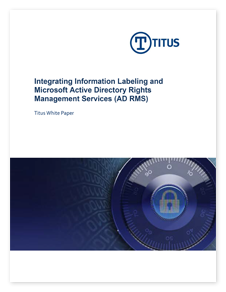 It provides an overview of Microsoft's Active Directory Rights Management Services (AD RMS) and its integration with TITUS' Document Classification and Message Classification product suites. This combination provides a powerful and intuitive solution for policy compliance and information protection.